A Random Fan: WOWEE Wednesday Guest Designer! 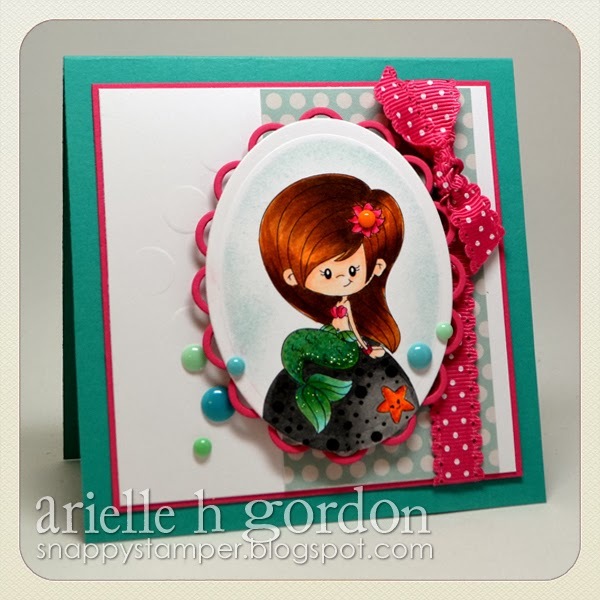 Hello, Arielle here, back with another little card using Monet the Mermaid! Isn't she fabulous? I love coloring mermaids, maybe because I was asked ALL the time if I was named after the Little Mermaid - LOL! One thing I like to do after coloring the tail, is to go back in with a fine tipped marker that is slightly darker than the Copics I used, and add little scales. Nothing fancy, just another layer or color and detail, like I did that here. I then took a small paint brush and painted a thin layer of Stickles over the tail. You can kinda see them here - they are the tiny dots at the bottom of the tail. For the rock, after coloring I went back in and added dots of a darker color. I have really enjoyed guesting for A Random Fan, the images are all just adorable! I love Arielle's work and this card is Beautiful using my Fave mermaid of yalls!!! Thank you, Heidi - you're so sweet!